I am writing this report in order that the South Tama County community will know about the progress on the restoration of the historic Wieting Theatre built in 1912. This community project is being undertaken by the Opera House Trustees, the Wieting Theatre Guild, and more than 100 other volunteers here in South Tama County. We have hired an architect, a contractor, and a grant writer to assist us in this important community project. The total project cost is estimated to be $1,209,443. The contractor has identified these costs through bids received from a number of local sub-contractors doing business here in South Tama County who are also supporters and volunteers in the project. I would like to list for you a number of the components in this restoration project. So many people, community groups, and businesses have supported the project since last fall. The project has over 255 donors who have, through pledges and cash gifts, donated $397,655 to the restoration project as of May 1, 2010. We have received fine support from the City of Toledo, the City of Tama, the Tama County Board of Supervisors, and the South Tama County Community School District. The Tama-Toledo Chamber of Commerce and Tama County Economic Development Commission have given their support and valuable advice to this project. Thanks so much to these fine servants of the general public. Our goal is to raise by pledges and cash gifts an additional $200,000 by July 1, 2010. Some of this amount we hope to receive from regional grant requests. We want to file for a Vision Iowa grant by July 15, 2010 and it is required that we have 50% of our project cost on hand by that date. As you may know, Tama County was named a Great Place by the Iowa Department of Cultural Affairs. 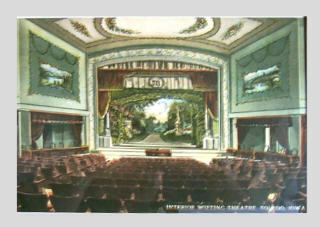 This means that the historic Wieting Theatre project can receive an Iowa Great Places grant over two years, State Historical Tax Credits, and other State of Iowa Historic Preservation grants. The local fundraising, the grants mentioned above, and in-kind donations would then make it possible to start the renovation project in January of 2011. The project will take about 9 months to complete. We are asking for your help in this historic project. Any amount that you can give is fine. You can make a cash gift or sign a pledge to be paid over two years. The new theatre seats are $375 each and there will be naming rights on the seats. The restored theatre will have 296 seats and over 100 have been sold. I am acting as the local project leader and you can call me at any time. I will answer any questions that you might have on the project or appear before any group. Please also call if you have any suggestions on this worthy project. I am so proud of all of the South Tama County Community and your support of this historic restoration project. Let’s do this for our younger generation so that the Wieting Theatre will be here for another 100 years bringing movies and the arts to Tama County.